I thought I’d take a break from telling my chicken tales to talk about art and my creative process. 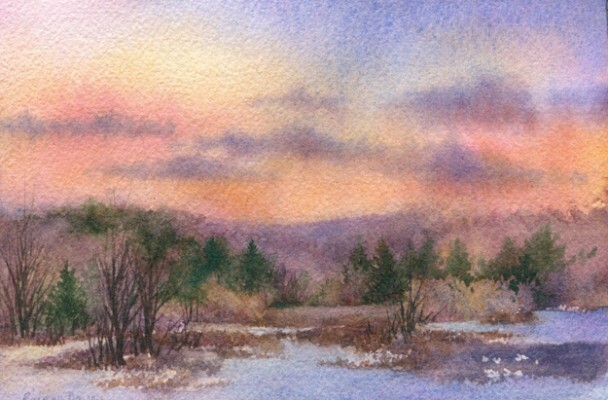 Today my medium of choice is watercolor (see “Sunset Memories” above) but I’m not tied to watercolor only. Over the years I’ve learned that as long as I’m being creative in some way there’s a certain peace inside me and that creativity doesn’t just mean painting or drawing. Creativity can include planting and tending my garden, nesting and cleaning my house, building a chicken coop, writing a blog post, cooking a fine meal and then, of course, there is the painting and drawing. Our creative options are limitless really with our only boundaries being those that we create in our own minds and that is where the battle begins for me. You see I tend to be a perfectionist although you wouldn’t think it by looking at me. It’s not my physical appearance – which at times can be quite disheveled – that I fuss over. What I do fuss over is every creative project I tackle. Oh what harsh critic I can be toward me. Luckily as I’ve gotten older I’ve become a little more forgiving and accepting of my creative output. I’m beginning to chill out about it all… finally! I know now that sometimes what I paint is good, sometimes not so good and sometimes wastebasket filler or tinder for my wood stove and that’s okay with me today. Don’t misunderstand, while I’d love to paint that master work every time I know that it’s all those other paintings that are teaching me how to paint that great one… and one day I will. Until then I’m practicing every time I pick up my brush or pencil and I can live with that because whether I’m practicing or creating a masterpiece it’s all about the process and not so much about the product. And the process so fun, frustrating and rewarding all that the same time! What a blast it is to be a creative person in pursuit of that ever elusive masterpiece. Visit my ETSY shop RaineyDeweyArt to purchase “Sunset Memories” or to view other work available for purchase.